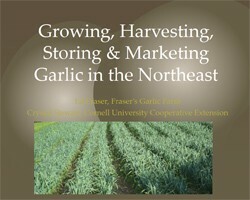 WNY garlic farmer Ed Fraser of Fraser's Garlic Farm and Cornell Cooperative Extension's Crystal Stewart presented at the NOFA-NY Winter Conference. Their presentation titled, Intermediate Garlic Production, focused on more advanced techniques to deliver a consistently high-quality garlic crop, including cover cropping plans, fertility management, weed control techniques, post-harvest handling, and seed selection. Information was based on research results, on-farm trials and experience.